Phonics is taught on a daily basis throughout the EYFS and KS1 and as appropriate, in KS2. Children are supported in naming and sounding the letters of the alphabet and digraphs as well as linking sounds and letters in the order in which they occur in words. Schemes such as Letters and Sounds and Jolly Phonics are used with the specific needs of individual children taken into account when planning methods of teaching. Skilled word reading involves both the speedy working out of the pronunciation of unfamiliar printed words (decoding) and the speedy recognition of familiar printed words. Underpinning both is the understanding that the letters on the page represent the sounds in spoken words. This is why phonics is emphasised in the early teaching of reading. At Cathedral school we take a great pride in our children’s attitude to and love of reading. Events such as Book Week have paved the way for a real enthusiasm in developing the essential skill of reading. Learning to read the words on a page is just one small part of developing a lifelong enjoyment of reading and an ability to use reading to discover new things. Our aim at Cathedral School is to help children become independent readers who enjoy reading and learn from it. Taking a book to read at home is just one part of our children’s reading diet. At Cathedral School children enjoy reading books they have chosen quietly in our class reading corners, in the library, with a peer or supporting a younger child as a reading buddy. They enjoy reading a range of different texts with staff during a wide variety of lessons to support their learning. They also read individually with a teacher, teaching assistant or Volunteer reader. Each child’s reading diet is specifically tailored to their individual interests and need. We use the Oxford Reading Tree scheme which offers a wide choice of new texts which include Traditional tales, Classics, a range of up to date and relevant non-fiction texts, poetry and even Graphic Novels. 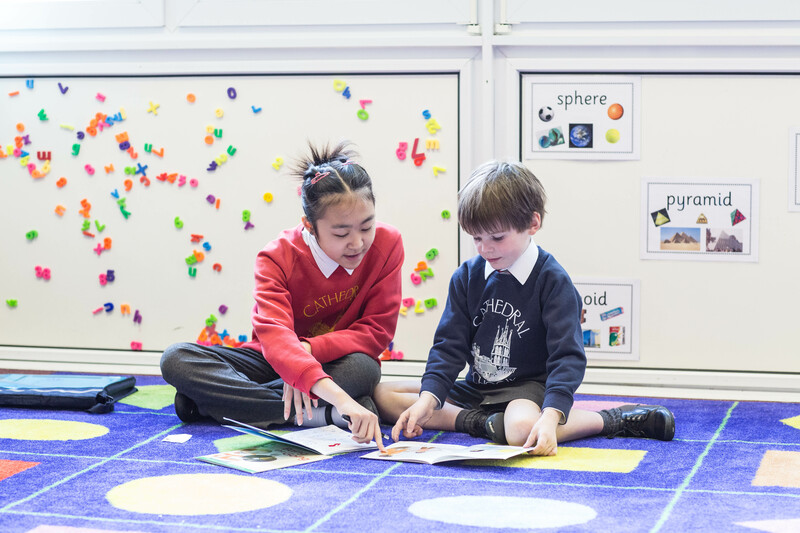 At school, children develop a range of reading skills throughout the curriculum including whole class sessions, one to one reading and reading independently. Staff and volunteers regularly record information about the reading your child has done at school in their blue reading record. This will be in the form of a comment or a sticker. Below is some information about the ways in which we teach children to read at school. Whole class teaching Whole class teaching happens throughout the day. Children are exposed to a wide range of texts in Literacy and across all areas of the curriculum, both fiction and non-fiction. They use their reading skills to find and interoperate information across a wide range of subjects. Children also have at least 4 dedicated whole class reading sessions a week. Specific reading objectives are targeted through exercises such as ‘Text Talk’, ‘Reading circles’, Independent Reading, Reading a class text and Comprehension Skills. These objectives are varied as required depending on the needs of the individual children. Reading with a teacher All children can expect to have a one to one reading session regularly with a teacher. 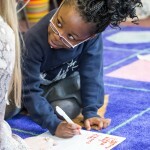 During independent reading sessions the teacher will target specific children to read with the aim of focusing on a specific objective as well as discussing the text and supporting the child’s enthusiasm and engagement in a wide range of texts in order to support the development of positive attitudes to reading and understanding of what they read. Reading with a TA All children will have the opportunity to read with a TA regularly. Some children will, based on specific needs, be daily or weekly readers with a TA. TAs will focus on specific objective as well as discussing the text and supporting the child’s enthusiasm and engagement in a wide range of texts in order to support the development of positive attitudes to reading and understanding of what they read. Reading with a volunteer Some children will, based on individual need, be daily or weekly readers with a trained Volunteer. 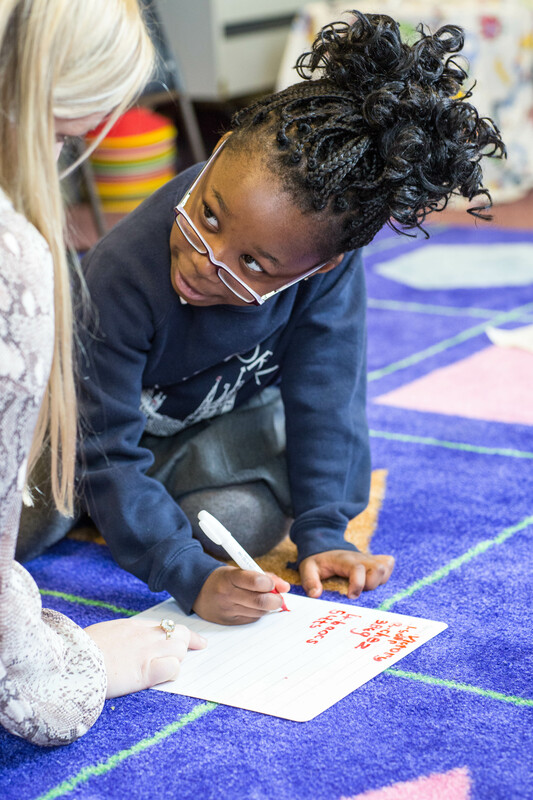 Volunteers will focus on specific objective as well as discussing the text and supporting the child’s enthusiasm and engagement in a wide range of texts in order to support the development of positive attitudes to reading and understanding of what they read. Reading with a buddy Some children will, based on individual need, be daily or weekly readers with a Buddy. The Buddy’s focus with be discussing the text and supporting the child’s and engagement in a wide range of texts in order to support the development of positive attitudes to reading and understanding of what they read. In class reading provision Every classroom has a dedicated quiet reading corner in which children have access to a wide range of fiction and non-fiction texts. If a specific text is not available they are able to request it. Children are also given access to a wide range of texts throughout the curriculum including on line texts. Reading scheme At Cathedral School we use the Oxford Reading Tree Reading Scheme. The scheme has many benefits including offering a wide range of fiction and non-fiction texts that are stepped in a way that supports children to make sustained progress. Each individual book has a guide for parents to help support the reading of that particular text. Children should be encouraged to read a wide range of texts in addition to the reading scheme. Children will move away from the reading scheme when staff judge that their progress, ability, level of independent reading at home and ability to choose appropriate texts is sufficient. This will usually happen from Year 4 upwards. Book Bingo Children across the school are given a ‘Book Bingo’ card. The cards suggest a range of books for the child to read independently. The purpose of book bingo is to encourage children to read and enjoy a wide range of different authors and texts; this will support them develop new interests and find new favourite authors. In year 5 and 6 these cards are personalised and children are given the opportunity to recommend books to each other. Opportunities to enhance pupils’ vocabulary arise naturally from their reading and writing. As vocabulary increases, pupils will learn to understand the relationships between words, how to understand nuances in meaning, and how to develop their understanding of, and ability to use, figurative language. Pupils will also learn how to work out and clarify the meanings of unknown words and words with more than one meaning.